Aldrin may not live to see it, but he thinks colonizing Mars is part of humanity's destiny. Buzz Aldrin, Apollo 11 astronaut and the second person to set foot on the moon, may be 87, but he's keeping his mind focused on the next space frontier. For decades now, he's thought about how to get astronauts to Mars, becoming more vocal about his plans in recent years. He's also a fan of virtual reality as a medium to communicate his vision: He partnered with NASA to build a Mars Hololens experience last year, and now he's hosting a 10-minute VR experience that walks you through his vision of how to get to Mars. Cycling Pathways to Mars features a holographic Buzz Aldrin walking viewers through a VR landscape that starts on the moon and uses that as a jumping-off point to show our solar system and how we might get to Mars. It's not easy to sum up, but Aldrin envisions having two ships constantly cycling between Earth and Mars on six-month schedules, taking advantage of when the planets line up favorable for moving back and forth between the system. Smaller launchers would dock with the two big cycling ships and head down to Mars' moon and eventually down to the planet's surface. That's an extremely high-level overview of what Aldrin shows off in the VR feature, which debuted at SXSW this week. 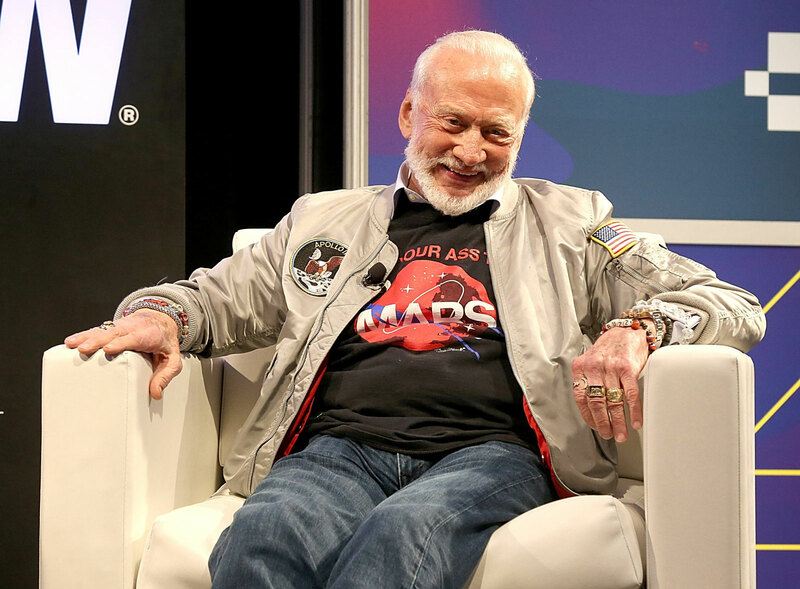 That's just part of Aldrin's presence in Austin this week, however: He also participated in a panel discussing how to get to Mars and then took the time to sit with a small media group to answer some questions. After trying Aldrin's VR experience for myself, I wanted to know how we can make his vision a reality. To make a long story short, his answer was: baby steps. "First, we have to understand the conditions under which we're going to use something," he said, referring to everything we need to built to get us to Mars and make it safe to live there. "Then we design something and we can see how it works on the ground, and then we can put it in orbit." The next step is a big part of the plan, using the moon as a localized testing site. "We need to bring a lot of things together to make [Mars] a habitable place for a number of people," Aldrin said. "It would be nice to design something like that at the moon." There will be intermediate steps between the moon and Mars, but the idea is to then use Mars' moon Phobos as a place where we can land and make final preparations for actually reaching the red planet's surface. "We don't have to get people there until we need to do the delicate [work]. We get them up there, they know what they have to do and they get it done," Aldrin said. He believes we'll be able to do a lot of work remotely, from Earth, but we'll need to be closer for final preparations because of the time delays between executing a command here on Earth and seeing how it works 225 million kilometers away on Mars. But we can also build the time delays into all the practice we do, whether it's here on Earth, communicating between the Earth and the moon, or another situation. One thing Aldrin made clear in his Q&A session is that he wants to colonize Mars -- which means some travelers won't be coming home. "I think it's better to do [let people live there permanently] than to go through the expense of having people there for a year and a half, two years and then bring them home," Aldrin said. "Especially if they have prepared to and made the decision, have the willingness and desire to go and spend the rest of their lives there, pioneering." Aldrin specifically said he hopes that colonizing Mars can become a national objective. "I think the objective is to expand the human race outward, and [Mars is] the most likely place to set up permanently." Aldrin won't live to see this goal met, but he's still committed to doing what he can to make it happen as soon as is reasonable. To that end, he's not interested in playing politics. When asked if he was worried about the current administration's policies slowing things down, he simply said, "I'm not involved in politics. Whoever is in the White House has to be my friend." But even if he was going to live long enough to go to Mars, he doesn't think it would be the best use of his time. "I'm more valuable here than I ever think I could be there," he said before jokingly noting, "I'm not an outdoorsman."